Rakusan did not include the Fan Series in his main sequence numbering. Therefore, the original number used for each of the 36 Series prints has been modified to identify the Fan Series members of its theme. The five different fan silhouette shapes have been here assigned arbitrary numbers 1 through 5. To indicate a fan design these shape designations are added to the 36 Series number separated by a hyphen. In themes which contain duplicated fan shapes, one has been arbitrarily designated A and the other B. 104-5 indicates that this is a Fan Series design with fan shape 5 in the 104 Lily theme. Like all other designs in this series, 104-5 was only produced in a single print run, and few copies are currently documented. At least some of the lily designs in this theme were adapted from sketches originally created in the late 1920s during the planning of design 69 in the earlier 100 Series (see below). 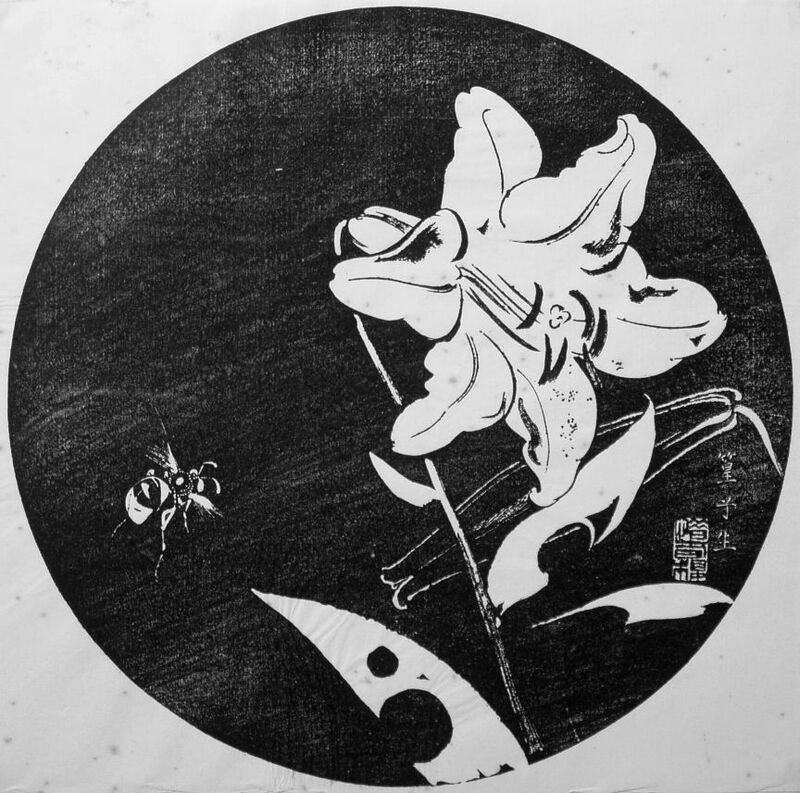 The composition of 104-5 includes two lily stems, one with a fully opened blossom with leaves, and the other only with a closed bud. 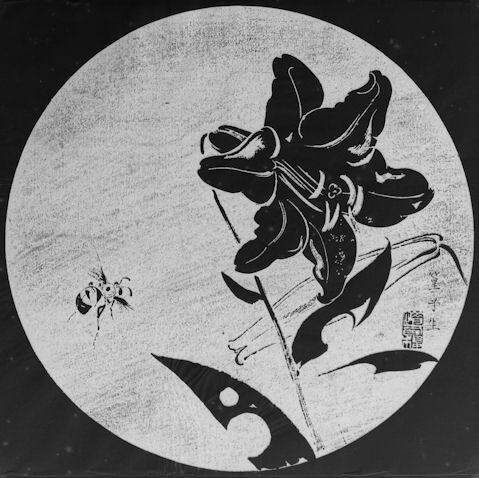 The open flower and its leaves in the foreground are shown silhouetted with internal lines - essentially a line drawing with the solid background darkened out. The bud behind and the stems are simple line drawings on that background. Apparently flying toward the flower is a honeybee. The bee is rendered in great detail, including blurring the wings to imply their motion. It is larger in scale to suggest that it is closer to the viewer and that the lilies are farther away. This design is not a true negative since the flower in life is a very pale color. This design is one of several early designs where Rakusan struggled with his ishizuri techniques. Bamboo Lily, Lilium japonicum, 笹百合, ささゆり, ササユリ, sasa-yuri, lit. 'bamboo-grass lily', is the native species illustrated in 104-5 (and also in 104-1, 104-3, 104, and 69).